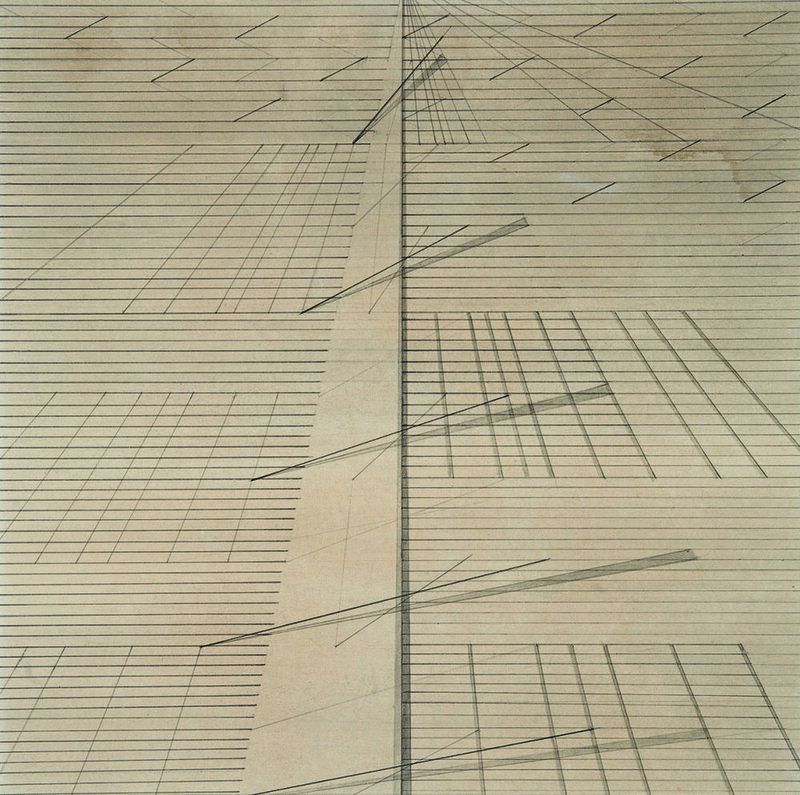 Untitled drawing by Nasreen Mohamedi, ca. 1975. Yet Mohamedi’s drawings are of course material, just ink on paper. One of the salient aspects of experiencing them is noticing the unbelievable tautness of her penwork, the craftsmanship with which she scribes the lines into the paper. The effect is quite different from Mondrian’s workmanlike application of color, Klee’s lines taken for a walk, or Martin’s unselfconscious, slightly shaky, pencil marks. Mohamedi’s draftsmanship has rigor and perfection. Remarkably, in 1970, two years before she made her diary entry, Mohamedi found a near-equivalent to her drawings just sitting there, waiting to be noticed. Of course she took a picture. The subject is a loom, and more precisely, a set of warp threads awaiting the insertion of horizontal wefts. It was not unusual for the artist to find geometries that she loved, and capture them through photography. She also took pictures of landscape features, water towers, stone terraces, in India and elsewhere in her travels. Yet none of these other photos, even her other depictions of weaving, strikes so closely to the heart of her artistic concerns. As with her drawings, it is easy to accept Mohamedi’s photograph as a pure abstraction, and disregard its basis in materiality. That is more or less how it was presented in a show of the artist’s work at the Metropolitan Museum in 2016. Certainly there is much to value in the picture without considering its actual subject: the way that the white lines float against a dark void, as if they had been etched into sheer nothingness; the syncopated pattern of the five threads that cut across the composition, each one anchored firmly into the upper edge, but nearly disappearing into haze as they reach the bottom. Those five threads provide the energy of the picture, and their respective positions seem carefully calibrated: two closely set parallels to the left; two further parallels to the right, tilting at an equal but opposite angle, widely spaced; and a single vertical that splits the image in two, almost but not quite at its center. If this is indeed a found composition, as appears to be the case, then the finding itself was an act of genius. Yet, like Mohamedi’s drawings, attention to the real substance of this photograph is amply repaid. Think of this picture as showing real threads and not just lines, and one begins to notice things that at first were obscure. There is, to begin with, a horizontal bar across the image, just above its lower edge. This is a wooden bar of the loom, part of the framework that pulls the warps straight. In the background of the image, you can just make out the loom’s heddles, little loops that pull up every other thread to allow for the passage of the wefts between. On each pass, a shuttle will carry the thread across. Then the alternating warps are lifted in their heddles, and the shuttle will come across the other way. Do this again and again and you have a plain-woven fabric. Also visible in the photo’s foreground, and providing the “join and splay and lance” that is achieved in Mohamedi’s drawings, are the sheds of the warp – the triangular negative space between the two sets of threads, one pulled up and one down. Then there are the threads themselves, likely cotton, the weaving of which has been a mainstay of the Indian economy for many centuries. Each thread has a slightly fuzzy quality, because a few fine fibers always remain free of the tightly-wound spiral structure imparted by the spinning process. This fuzz provides much of the texture of the picture, its weave one might say, which in turn plays interestingly against little motes of dust and other imperfections on the film itself, a texture on a texture. The threads are not lines. They have a thickness to them, and Mohamedi has shot them in such extreme close-up that each one is itself seen in perspective, thicker toward the front of the picture and receding almost into invisibility to the rear. The exceptions are the five strong diagonals mentioned earlier, which are mysterious with respect to function: they are not connected to the heddles, and are far too taut to be loose threads that have escaped the loom’s grid. This matter of perspective brings us to the crux of the picture. The bed of warps stretches back into space toward a single vanishing point, as surely as the lines in the floor of a Renaissance painting, or two railroad tracks heading to the horizon. In Mohamedi’s photograph, the concept of a vanishing point is literalized: the threads recede from view as they recede from the viewer. Focus only on this gradation, for a moment. Forget that you are looking at a loom, and see the picture only as a passage from dark to light. It works; the rush of perspective disappears, and you see only vertical convergence. But then look again, see the loom, the frame and heddles and threads. Forget that you are looking at the work of an abstractionist. The photograph resolves once more into a picture of a thing, taken by a woman with a camera loaded with black and white film, bending down to take her angle just so, the rackety clacking sounds of the textile mill in her ears, the quieter click of the shutter as she keeps this one moment intact forever. Recall Mohamedi’s diary entry of September 1, 1972: “thin threads into space… a pure vision of non physical space.” Those two phrases describe an opposition, but also a desire to resolve the duality into a new synthesis. In this photograph she succeeded, making the “pure vision” of abstract pattern and the actuality of “thin threads” as one. It is a tenuous identification, a vanishing point in its own right. The opposition converges on the photographic image, which faces both ways. That is the nature of photographic representation. When it comes to pictures of things, vision and materiality are always held in tension.